#ChesterCulture – Chester City Passion – Good Friday 2016. 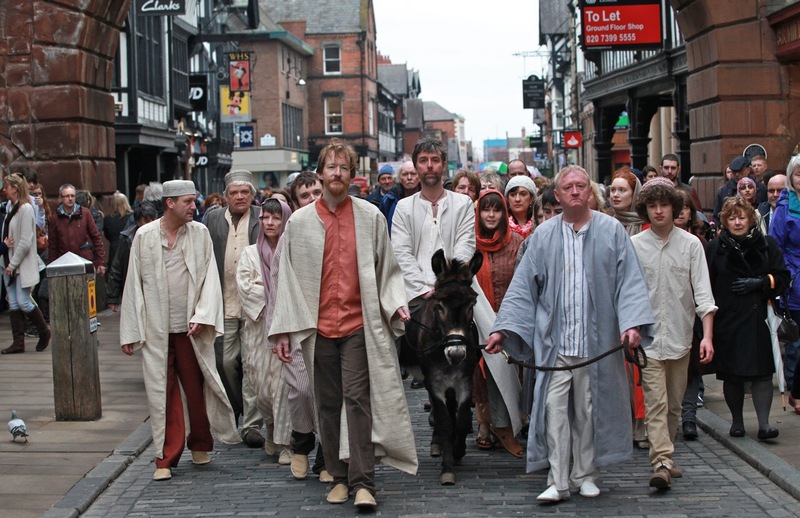 When the Chester Mystery Plays were taken on by the local Guilds in the 1300s they were performed on the streets and Rows of the City Centre on wagons that were pulled from site to site. into Jerusalem in 2013. He will reprise this performance on Good Friday as he proudly brings Jesus under the Eastgate clock surrounded by the performers and school children. At the full company rehearsal on Sunday the Northgate Church roof was raised by Karamba Samba, performers and school children singing a very loud “Hosanna!”. The Chester City Passion performance will start at the Eastgate Clock at 10.30am on Good Friday, 25 March, with Jesus’ entry to Jerusalem. Jesus (carried by Lucius) and his followers will process to the Cross for the Temple scene and the Last Supper. The performance will then move to the Town Hall Square for Gethsemane and the Trial, finishing at the West door of the Cathedral with the Crucifixion. This will be a free event, suitable for all the family. Good Friday 25th March 2016, 10.30am on the streets of Chester. It is difficult to express how wonderful this tribute to the community of Blacon was. Written and produced by Helen Newall and Matt Baker along with the people of Blacon. This is local musical theatre at its finest. Over 200 children from 6 Blacon schools, the Blacon choir, 3 professional actors and a band. One full hour of pure energy filled the Cathedral last Wednesday and Thursday and left the audiences amazed and empowered. Positivity is the bottom line here. The performance tells the story Blacon from the eyes of a child and based on a school year. Memories from all generations come to life on the stage. Along with a full size screen with filmed images from Blacon the songs tell us stories of growing up in the community. We are introduced through song to the Blacon milkman, school dinners, the play bus, the nativity play, an outing to the Chester Baths, sports day and so much more. The 3 professional actors: Judi Jones, Rachael Rae and Francis Tucker lit up the stage. Their flawless interaction with the students was a thrill to watch. Songs, laughter and emotional memories filled the fast paced show. David Williams, chair of the Blacon Education Village and Dee Primary explained that the project started about 12 months ago when he approached Theatre in the Quarter with his idea. The six schools of Blacon have been completely refurbished, reorganised and updated. It is a new educational collective. The community did not want to lose the memory of the old schools and all the wonderful things that have happened there. Creating this musical preserves the memories of the students, teachers, all those involved in the school and community. Mr. Williams also expressed the desire to change peoples’ misconceptions about Blacon. The future shows in these children, their hard work , dedication and pride in their area. Chester Culture applauds the efforts of Davis Williams, The Educational Village, all the teaching staff, employees, children and the entire community of Blacon. May the profile of Blacon be raised and brought to the attention of all. Following the success of last year’s Over By Christmas, Theatre in the Quarter (TIQ) is set to embark on another ambitious large-scale choral project which this time sees local people working alongside professional actors. TIQ – in partnership with Blacon Education Village and Homegrown Dance Theatre Company – have created Best Days Of Our Lives, a performance about the vibrant community of Blacon. The piece is based on stories collected from pupils (past and present) at Blacon’s schools, many of which are about to be totally rebuilt. The project aims to challenge the historical negative perceptions of the area, to raise aspirations and to create a sense of pride among the local community. The production will be accompanied by a short film created by Chester-based Dee Digital. The film will feature stories and music from the project and become a permanent resource and legacy for the Blacon community on its journey of renewal and regeneration. Best Days Of Our Lives is the latest collaboration from TIQ’s Writer-in-Residence Helen Newall and Artistic Director Matt Baker. An acclaimed playwright and librettist, Helen is also a Reader in Performing Arts at Edge Hill University and maker of sound and visual installation work. Recent TIQ projects include Over By Christmas and Silent Night. Matt Baker’s recent compositions for the company include Alice, Silent Night and Over By Christmas. His credits as a composer and musical director also include productions for the Dukes Playhouse, Lancaster; The Nuffield Theatre, Southampton and the highly successful Chester Mystery Plays 2013. Homegrown Dance Theatre, led by Director Julia Williams, has collaborated extensively with Theatre in the Quarter, particularly with projects across the schools in Blacon. Julia will be developing the dance elements of the piece with the young people. The 200-strong company drawn from the community of Blacon will be led by actors Judi Jones, Rachael Rae and Francis Tucker. Judi Jones’s extensive credits include Heartbeat, Fat Friends and the controlling Barbara Kirk in Emmerdale. Rachael Rae has recently been seen playing the lead role in Mam I’m ‘Ere at the Royal Court, Liverpool. Francis Tucker is best known to audiences in the North West for his show-stealing performances as the Dame in the Liverpool Everyman and Playhouse Pantomimes. Dave Williams, Chair of Blacon Education VillageBest Days Of Our Lives will take place at Chester Cathedral on Wednesday 21 October at 1.30pm and 7.30pm and Thursday 22 October at 7.30pm. Tickets, priced £7 and £5 are available from Chester Cathedral by telephoning 01244 324756 or online at www.chestercathedral.com. 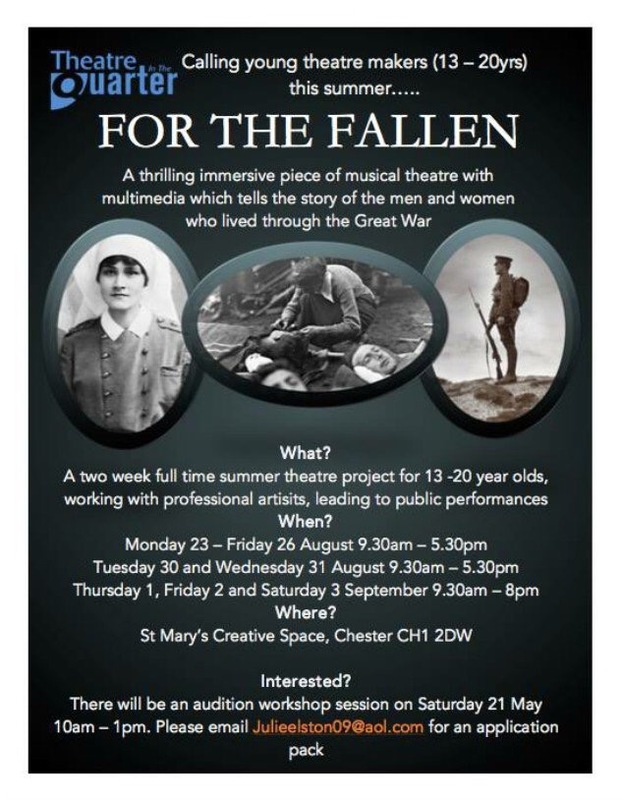 The project is made possible by generous support from Blacon Education Village, Avenue Services, Cheshire West and Chester Council and The Earl of Chester Trust. “Stille Nacht, Heilige Nacht” when the choir intoned the lines of the title song in German it brought me, as a native German speaker, to the brink of tears. It was the culmination of a truly inspired and delightful show, that combined classy acting, understated, yet inventive props, clever stage management, and harmonious tunes. 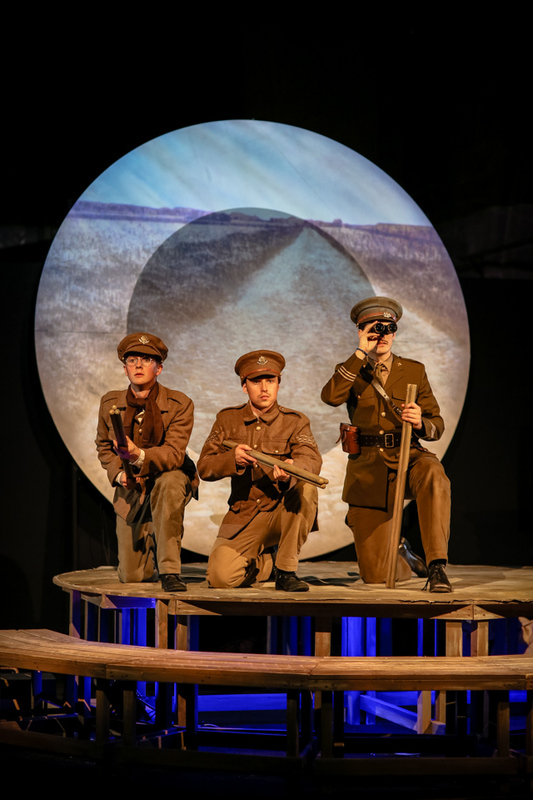 The play opens with two shots being fired as we follow the Cheshire regiment on its way to France, Belgium and to the German border. All the while glimpsing into the lives of family left behind. The cast, Aled Bidder, Hannah Good, Rhys Isaac-Jones and Tom Lincoln swap into different characters seamlessly and with ease and they bring the stage alive with minimalist props. A pair of sticks is transformed into a gun, then a bedframe and a log fire. Judith Croft has created a brilliant background set: a transparent background onto which different scenes and landscapes were projected, but which also allowed for the actors to stand behind and be seen through a veil, speaking from the behind so to say. (see picture). The contrast between the very low tech props, the professional lighting and background setting is very striking and works well. The music, by Matt Baker, was weaved nicely into the play. The songs were worked into the play harmoniously, with some very witty lyrics. There was no “big drama” no heroes, no villains, just the everyday real drama of a world at war, which somehow brought the grim reality much closer to home. 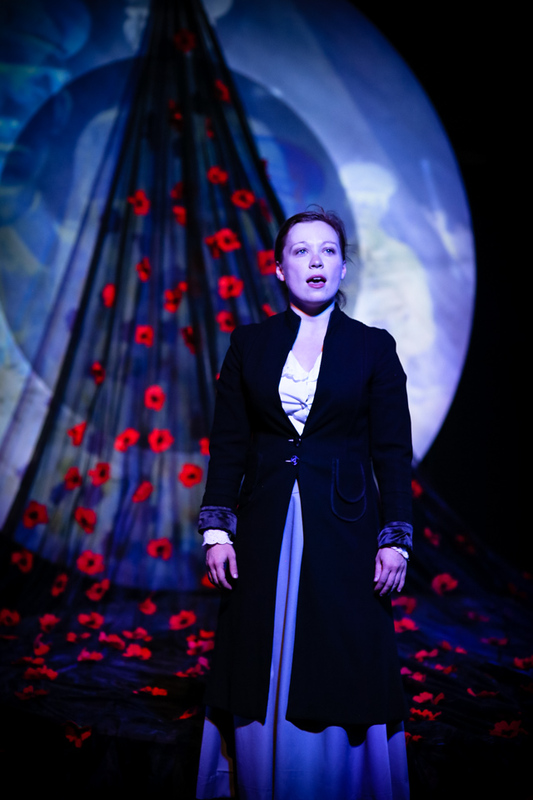 Set in the beautiful St Mary’s Centre and in remembrance of The Great War- Theatre in the Quarter- have once again outdone themselves! Written by Helen Newall with original music by Matt Baker. Directed by Emma Lucia and designed by Judith Croft.